This is the second charm bracelet I've ever made. The first was more spread out, the charms hung individually at regular intervals and were mostly blue, so this charm bracelet was quite an adventure for me! There really is a bit of everything in this. 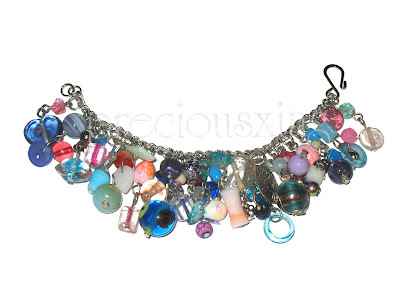 Everything from glass-metal-shell beads and also an imitation of an ancient Roman coin, a button and more!! I really liked working with so many colours in one piece which is a rare thing for me as I usually keep to 2-3 colours per piece. 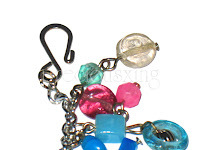 The s-hook clasp is a nice lil detail to this piece also. It makes the bracelet that little bit easier to get on and adds a bit more character to the piece than an ordinary lobster clasp would.